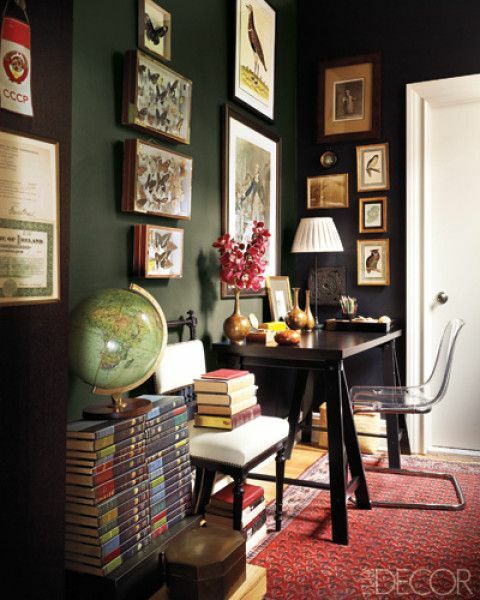 When I think of an old world inspired office space, I think of dark walls with deep hues of emerald green, red and grey. I see walls with panelling, timber floors with traditional rugs, chandeliers, bookcases with glass doors, heavy velvet curtains hanging from the ceiling to the floor, brass accents throughout the room, leather Chesterfield sofas, a heavy timber desk and green lamps. 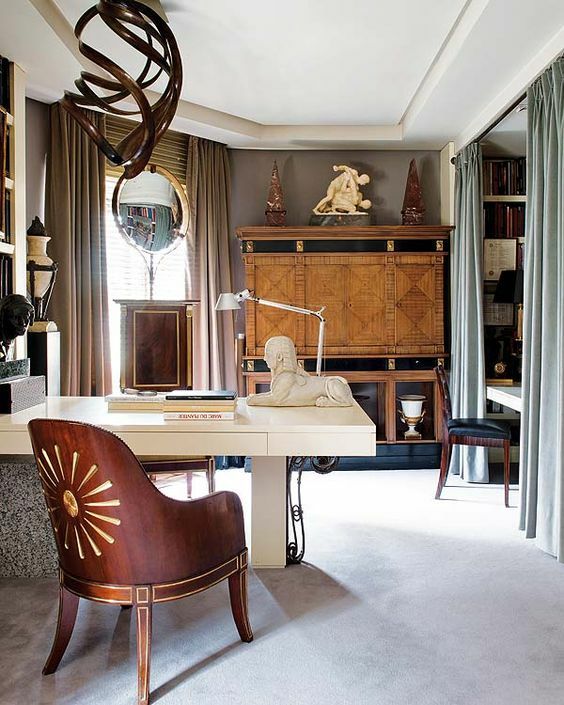 The old world design style is very masculine, especially when considered in office spaces, as only a businessman would have a need for an office. It was almost a room to host a gentleman’s club. An old world office space is a design that is thought through and is very detailed. 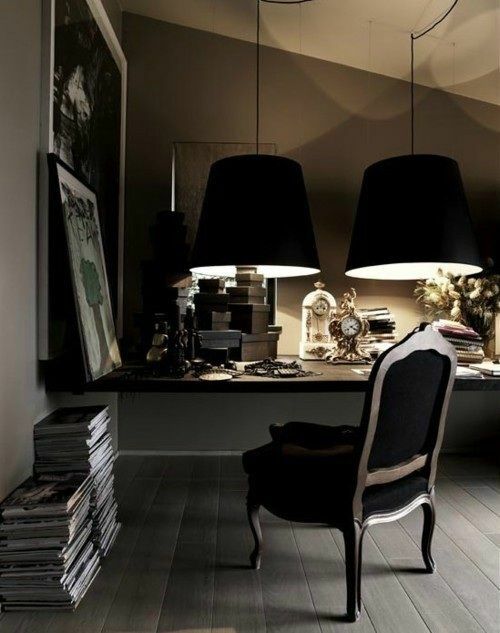 Various elements combine this style together, like the dark colours and use of heavy timber furniture. It is an office space that has a need for an entire room, it cannot just be cradled into a study nook. It is grand, elegant and masculine. A businessman would traditionally entertain business partners, colleagues and clients in this type of space so it is essential to create an everlasting impact on those who enter, with the successes of the user. 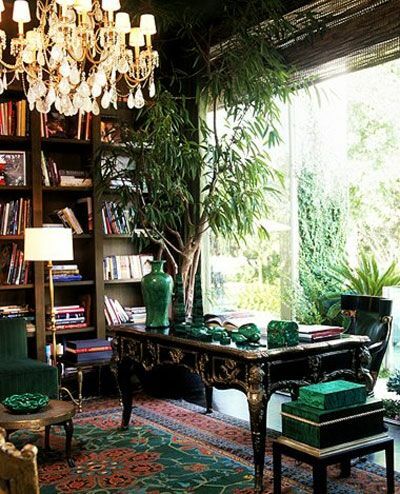 Bookcases usually align the room filled with books, memorabilia, high achievements and treasured items. There is not only the heavy timber desk centred in the middle of the room, but there are multiple setting areas with large leather Chesterfield sofas and elegant buttoned armchairs. Traditional rugs separate these sitting areas from the desk area. 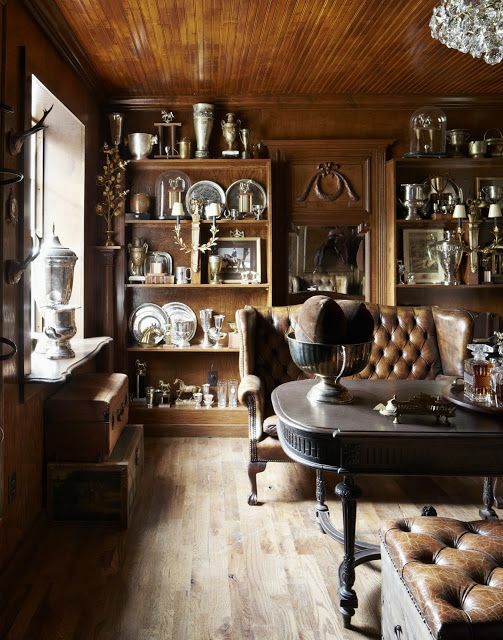 Trinkets like atlas globes, statues, magnifying glasses and butlers trays are on display throughout the space. Old world office spaces may have grand windows, but heavy velvet curtains drape to the floor from the ceiling therefore grand forms of lighting like huge chandeliers and table lamps are used to lighten the room when needed. An old world inspired office space is very structured, everything should have a place. It has a serious and sophisticated atmosphere in its grandeur which is heavily impacted by the design elements that bring the space to life. It creates a sense of history and mystery in the room.